France's foreign minister to meet Arab League ministers, as well as with PM Netanyahu and PA chairman Abbas in bid to revive stalled talks. France's foreign minister will head to the Middle East this weekend with an initiative aimed at bringing Israel and the Palestinian Authority (PA) back to peace talks under an international framework, Reuters reported Friday. 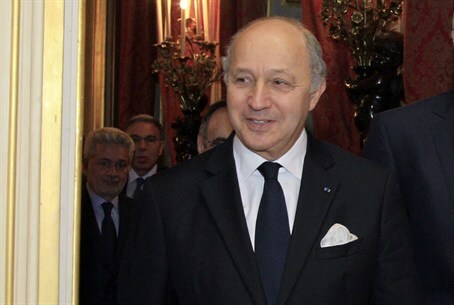 With the region's crises worsening and Washington reassessing its options on U.S.-Israel relations, France sees a narrow window to resume negotiations, according to the news agency. Foreign Minister Laurent Fabius will explore the prospects for talks with key Arab League ministers, including Saudi Arabia, in Cairo on Saturday and PA chairman Mahmoud Abbas in Ramallah and Israeli Prime Minister Binyamin Netanyahu in Jerusalem on Sunday. "Everything points to inertia, but we believe that this inertia is deadly," a senior French diplomat quoted by Reuters said. "We can no longer isolate the Israeli-Palestinian conflict from the regional context." "The method to reach a definitive solution has been for both sides to meet face to face with the Americans as an honest broker, but this method has failed," the diplomat told Reuters. "It needs international support." Work on the resolution began in March, immediately after the elections in Israel. Right after those elections, Fabius called for negotiations between Israel and the PA to resume in order to achieve "a comprehensive and lasting peace accord" based on the “two-state solution”. The Security Council in December rejected a resolution, brought forward by the PA’s allies, that would have set a deadline for reaching a final peace deal and pave the way to the creation of a Palestinian state. Referring to the proposed French resolution earlier this week, Abbas said the PA would only back a proposal that raises all of their demands, indicating the demand for an independent Palestinian state on the 1949 Armistice lines with the eastern part of Jerusalem as its capital, and a clear date set for the end of negotiations and implementation of PA sovereignty. Abbas emphasized that the PA fundamentally opposes recognizing Israel as a Jewish state, reiterating his vehement rejection of the recognition that Netanyahu requested in talks. If recognition of the Jewish state is included in the French proposal the PA will not back it, warned the PA chairman. "The French initiative is counter-productive because it gives the illusion to the Palestinians that they will get something from the international community without having to make concessions," she was quoted as having told the French daily Le Figaro.